Major renovations of the University of Cincinnati’s previous College of Medicine building, now the Health Professions building, led to The Winkler Center for the History of the Health Professions’ acquisition of numerous, intricately decorated artifacts altogether known as The Cantagalli Pharmacy. 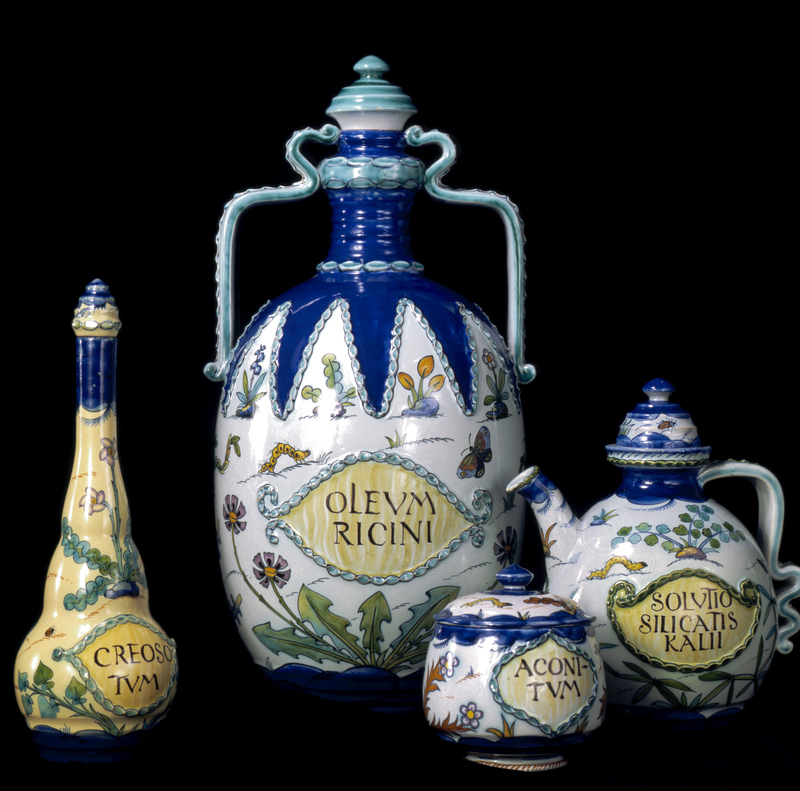 The entire collection represents a precise imitation of a 15th-16th Century Italian Apothecary and originally functioned as an exhibit for the 1900 Paris Exposition. The Cantagalli Pharmacy in its Exposition configuration. This photo also serves as a link to film footage from the 1900 Paris Exposition. The creation of this historical reproduction was the suggestion of Professor Carlo Guerrini and was principally performed by the Cantagalli Pottery of Florence, Italy, probably sometime during the mid-19th century. The Cantagalli jars are a 109-piece set; the majority of the ceramics’ beautiful decorations of various herbs are accredited to Ulisse Cantagalli, who had inherited the Pottery from his father. The central fountain, however, was designed and modeled by Innocenti Bruno and Prosperi Franscesco; their initials are engraved on the fountain’s ribbon. A postcard picture of the SS Paris. This photo also serves as a link to contemporary film footage of the ship. Dr. Martin H. Fischer’s wife supposedly discovered The Pharmacy stored within a Florence art shop; records suggest it was purchased for 36,000 liras (that’s $2,160 in 1927). It was later shipped from Le Havre on the SS Paris in 1926 and then donated in that same year by Dr. Fischer and his wife in memory of Laura Rust Leonard, Mrs. Fischer’s mother. the Cantagalli Pharmacy installation, ca. 1919. This photo serves as a link to a full copy of Some Views of the College of Medicine and General Hospital, which contains early photographs of both facilities, including the photo above. The tiles for this engraving have been missing since the renovations. The original display, practically in its entirety, in the south wing lecture hall of the Department of Physiology. At one point also, a bronze infant figure of St. John had stood atop a lithograph stone on the center counter. This was speculated to be one of the sculptural works of Donatello or more likely, perhaps one of his pupils or imitators. The figure though, disappeared shortly after Dr. Fischer’s retirement. Unfortunately, The Cantagalli Pharmacy no longer exists constructed in it’s entirety as it once did in the Department of Physiology. Fortunately however, many of its relevant artifacts have been preserved and some have been put on display at The Winkler Center! The collection continues to be approached and considered as something treasured and extremely rare: there are reportedly only two other pharmacy reproductions similar to it in existence. Much of The Cantagalli Pharmacy now resides in the Stanley J. Lucas Board Room of The Winkler Center. For more information, to view a collection, or for a tour of The Winkler Center, please call 558- 5120 or email chhp@uc.edu to schedule an appointment.